LED flood light is a broad beamed, high-intensity light. So far,LED Flood Lights have been used in long yard areas and many different areas, from security purposes to porch lighting. And they can be used both domestically and commercially. They cast a wider beam of light than a spotlight, making LED flood lights the more economical choice for outdoor fields and parking lots. 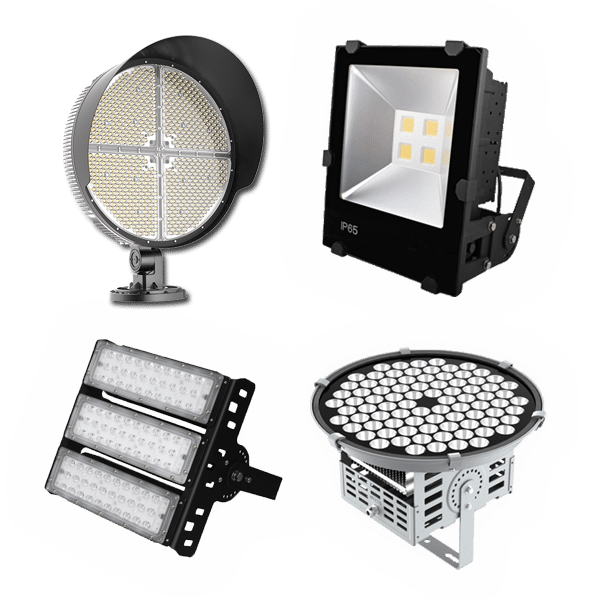 Most people will choose LED flood light for their lighting purpose, as there are a lot benefits over incandescent flood lights. The conventional flood lights are available in the market but they have several disadvantages over LED flood lights. As LED flood light does not contain mercury, so they are Eco-friendly lighting solutions as compared to other light systems. Also,LED flood lights are long lifepan and energy efficient than traditional fluorescent and incandescent lights. LED lights are tougher than normal bulbs and this durability makes them withstand harsh weather conditions. You can also use remote controller with LED flood lights. And Some motion sensor LED flood light comes with a motion sensor. So you can use them as security light. Our outdoor LED flood lamp can withstand a variety of weather conditions including high winds, rain, and freezing temperatures. Our LED flood light bulbs also can perform over long distances from the actual bulbs to the field’s surface. You can choose from a variety of indoor and outdoor LED flood bulbs ranging from 10W to 1,000W from 130 to 1,500,000 lumens. Our LED flood lamp can save you up to 85% in energy usage compared to traditional flood lighting. Most of our outdoor LED flood lights has a lifespan of over 50,000 hours. This will meet the requirements to replace hard-to-reach bulbs in out-of-the-way locations. Our indoor and outdoor LED flood light includes motion sensor LED flood light, LED stadium lights and solar LED flood light. It’s wise choice to convert traditional flood lighting into more energy efficient LED outdoor flood lighting, with all exterior LED flood lights containing no mercury. For more information about our indoor and outdoor LED flood light, or to order any of the LED flood lamps shown below, just contact us. Our LED lighting experts are waiting to communicate with you. As a leading LED flood light manufacturer, we will advise you on our best outdoor LED flood bulbs for sale to meet your needs. This is the new model LED flood lights in AIS LED. This is the new model outdoor LED flood lights. This is the high lumens IP65 Waterproof LED Flood Light ranged from 50W to 600W. Our LED flood light bulbs range from 10W to 100W. Whenever you need motion sensor LED flood light, solar LED flood lamps, LED stadium lights and so on, you can find them here. AIS is your one-stop LED flood light supplier. We design all our indoor and outdoor LED flood lighting with high lumens SMD LED chips. This means our stadium LED football lamp has high lumens which is more than 120lm/w. Using our LED flood lamps will help you and your clients to save more energy and money. You do not have to choose between inefficient incandescents and fluorescents that contain mercury. Our LED flood bulb is safe, environmentally friendly and contains no toxic mercury.Our LED flood lights use 10%-30% energy to traditional lights. As we know,consuming less energy results in fewer greenhouse gas emissions being released into our environment. We use high quality LED driver with our LED outdoor flood light bulbs. Also we use innovative cooling technology with cooling heatsink. This will ensure our LED flood lighting with 50,000 life span. What is 50,000 hours? If you ran one LED lamp for 6 hours per day , it would last for nearly 23 years. So you may never change another light for long period. With our professional technical team, we design our LED flood lights with the most attactive appearance. LED lighting is the most gorgeous lighting that illuminates people and surroundings in colour-rich light. Our LED flood lighting are designed to blend seamlessly with any architecture. Also,the proprietary diffusing lens and reflector system delivers an optimal light distribution. Our LED outdoor flood light bulbs come with a yoke-style bracket. You can position the LED food lamp in almost any angle for many mounting positions. Why should we choose LED floodlight? LED floodlights have many uses, from security purposes to porch lighting. And they can be used both domestically and commercially. The best thing about LED floodlights in particular is that they consume a lot less energy while still giving you the same amount of light. So you don’t need to use a huge quantity of bulbs or less efficient halogen floodlights. They are also built to last 50,000 hours, which is far longer than their halogen counterparts. There are a host of additional features available too, including motion sensors and timers, as well as portable and solar LED floodlights options. What is Motion Sensor LED flood light ? Motion sensor LED flood lights is designed with infrared sensors. The sensor have a 180-degree range of motion, picking up on heat waves when someone or something within this range is in motion. Depending on the sensor, the light will remain active for 1 to 10 minutes when human or animals left. Then the motion sensor LED flood lights shut off automatically. This is a great safety feature which also helps save energy in cases when the homeowner forgets to turn the lights off. This is why the sensor LED flood light can be used as security light. What is the purpose of LED flood light? The main purpose of LED Flood Light is to make our outdoor area brighter with high-intensity light. High Voltage LED Flood Lights gives us a more high-intensity light to secure and safe your outdoor space. LED Flood Light is strong lights and broad-beamed, high-intensity artificial light. This High Voltage LED Flood Light using the latest solid-state lighting technology. This luminaire can be used both as outdoor and an indoor LED Flood Light but depending on the lumen output how much you required. What are the benefits of replacing my ordinary bulbs with the LED flood lamps? LED Flood Bulbs last a very long time, typically 50,000 to 100,000 hours. Less heat. LED flood lighting fixtures are extremely efficient converting electricity into light. Highly recyclable – with no hazardous parts, you can easily reclaim most of the parts in an environmentally safe way. As a leading LED flood light factory,we have series of LED flood lamps for your lighting purposes. How many lumens do I need to replace 400W Metal Halide flood light fixture? There is a lot of factors that we need to consider into answering this question. Some LED flood lights suppliers havn’t explained it clearly. As our experience, you need at least 10,000 lumens to replace a 400W Metal Halide. This means you need at least 80W LED flood lamp. Some other factors come into play, like surface reflectivity, obstructions and other source of light, such as natural light sources coming into the building. AIS LED designs light solutions. We are lighting agnostic. We will select the best exterior LED flood lights that meets your needs. So we have the ability to replace 400W Metal Halide with 10,000 lumens up to 30,000 lumens. We do find that you need more lumens indoors to do a proper replacement than you do outdoors. A lighting photometric analysis will determine how much you need to create the proper brightness. What factors should I consider when I choose LED flood light bulbs? It is seldom mentioned in the product page if you are a constant some on-line shopping customer. As a reliable LED flood lights manufacturer,we remind you to pay attention to this factor. The fact is that the LED chips will be damaged if the junction temperature keeps incredibly high. A good LED flood lighting should have effective heat sink system transferring the heat from the internal structure to outside. Aluminum is a good conducting material to fabricate the heat dissipation system. In AIS, LED flood lamp is made of aluminum or the related alloy to make it long lifespan. The power of our exterior LED flood lights are ranged from 10W to 1000W. However, how many power should you choose? If you intend to use the lights for backyard, BBQ party or outdoor activities in your home, the lux level should be around 100. How do you find the corresponding wattage? For example, if you have a 50 sq meter yard, the brightness required is 50 x 100 = 5000 lumens. For the LED having 130 lumens per watt, the power needed is 5000 / 130 = 38.5W. And hence 40W LED would be suitable. This value increases with your size of backyard as well as lux requirement. If the need to do the vehicle repair work in your garage, you will need around 500 to 600 lux. Similarly, you may buy 200W LED floodlights for each 50 sq meter. It is not necessary to buy one single light. Instead, you can have 4 to 5 sets of 40W LED flood lamps putting around the ceiling to achieve better uniformity. Water resistant is a vital feature for outdoor LED flood lights. To be able to work under rain or snow storm, the luminary should have at least IP65 ingress protection rating. We always heard that doing LED replacement with halogen or metal halide lamps saves a certain percentage of energy. What is the truth? It is all depends on luminous efficiency of the LED flood lamps. For example, if a LED light has the specification of “120 lm/W”, it means 120 unit of brightness is emitted for each wattage power consumption. Let’s do the quick calculation. If the 100W halogen bulbs has luminous efficiency of 20 lm/W, it produces 100 x 20 = 2000 lumens; however, if we use LED light, we also need 2000 / 120 = 20W. That means a 20W LED bulb and 100W halogen can produce the same brightness theoretically. So we can save (20W – 100W) / 100W x 100% = 80% energy. Generally higher the lumens per watt (lm/W), higher the lighting efficiency and the price will be higher in normal circumstances. Maintenance can be very challenging for seniors due to reduced physical ability, health issues or budget constraints. Eliminate the need for bulb changes by outfitting exteriors with LED flood lighting solutions. LED flood lamps are designed to last for decades – making them a great, low-maintenance solution for aging individuals who may be unwilling or unable to replace outside light fixtures. Another reason to replace the conventional light to LED is the increased life span. 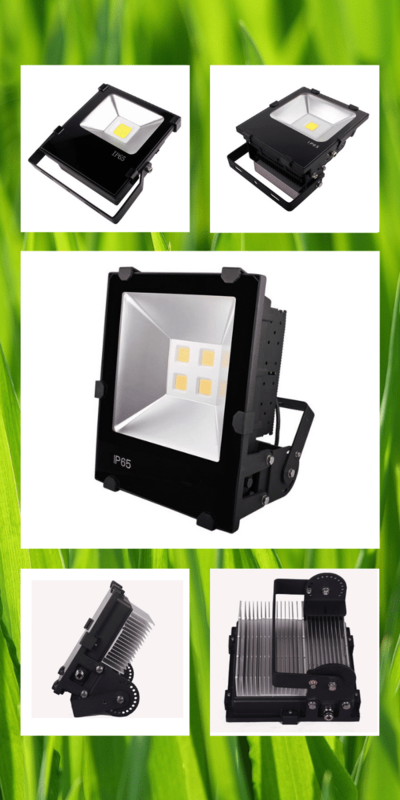 According to the product description, the working lives of the LED flood lights can be 50000 to 80000 hours, which is 5 to 8 times of halogen and metal halide lights. The lights having higher life span would always be your best choice because it is costly to buy the new lamps & install them, especially you are having the large-scale replacement. If you turn on the lights for 10 hours per day, LED runs 22 years. In reality, many customers complain that the metal halide or halogen lamps goes off easily, within 4-8 months use. Hence, switching to exterior LED flood lights save you a lot of time and money. Which power of LED floodlights should I choose? You need to consider a few things when choosing the brightness of your LED flood lights. Firstly,you need to consider the location where you use the flood lights. What is the area needs to be lit up? Will you be intruding on your neighbour’s property? Will you be distorting the vision of oncoming drivers? You can generally avoid the latter by making sure the floodlight is pointed downwards at a 22° angle. These are all important factors to consider before mounting your flood light. As with all LED lights, the brightness of floodlight is most accurately measured in lumens, rather than watts. For instance, a 10 watt LED floodlight will give out the same brightness (1200 lumens) as a 90 watt halogen, but it’ll consume far less energy. How can I use the 220v LED flood light in 24VDC supply? If you need to use 220v led flood light in 24VDC supply,you need a DC-to-Ac converter. In fact,as a leading LED flood bulb supplier, we offer customized solution. We can offer 24VDC LED flood light. You can contact our lighting expert for any question. What color temperatures are available with LED flood lamps? Color temperature for light bulbs is measured on the Kelvin scale. LED flood Bulbs come in a variety of colors, but the most common are in a range from 2700K to 7500K. The unfortunate thing is that the only consistent measurement is the Kelvin scale. Many LED flood lighting manufacturers like to use terms like Day White, Natural White, Warm White and Cool White. But there is not a standard that defines a Kelvin temperature to associate with those terms. The general rule is WARM (2700K) to COOL(6500K+). The warmer the light, the more yellow tones, the cooler the light, there are more blue tones. To help you understand it better,you can watch the following video. What is the most common reason LED flood lights fail? Mostly it is heat. Heat is the enemy of electronics. The hotter it is, the shorter of the lifespan. However, with good design, AIS aways creates a light or fixture that can withstand some high heat environments. Typically a fixture or bulb with effective heat sink will last longer. So you don’t need to worry about the life span of LED flood lamps in AIS.